Thousands of people are getting sick from food they have eaten. They suffer the effects of food poisoning. Food poisoning is a condition related to contaminated or spoiled food usually caused by improper food handling. The symptoms of food poisoning consist of sudden onset of severe vomiting and diarrhea, usually between 3 and 24 hours after the contaminated food is eaten. In healthy individuals, symptoms of food poisoning usually resolve within 24 hours. However, the vomiting and diarrhea of food poisoning can be life-threatening for very young infants, elderly people, and anyone with an immune system deficiency or illness affecting the immune system. 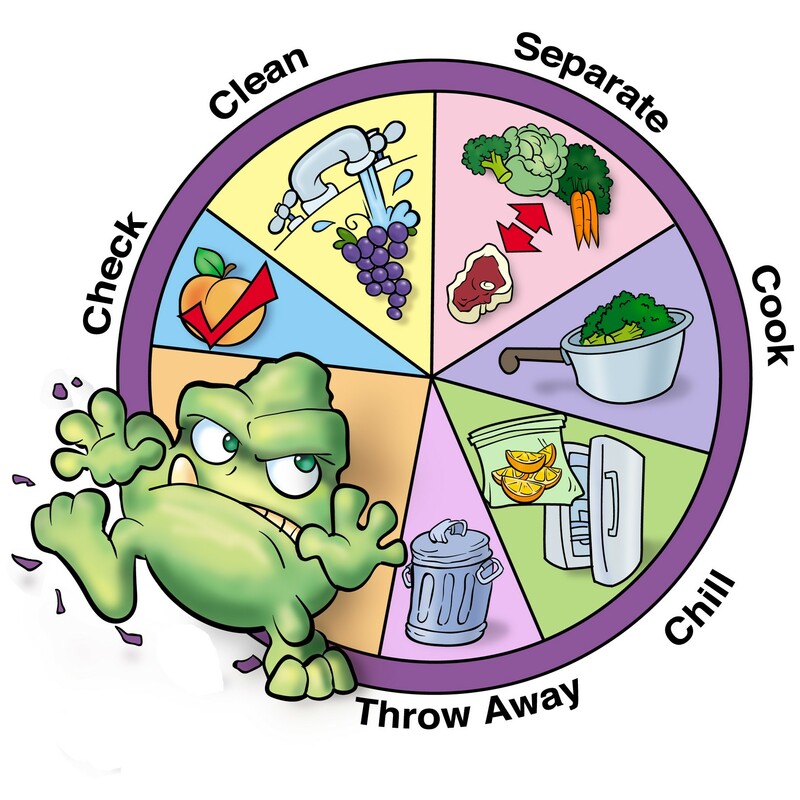 What exactly are the steps to be taken to protect yourself and your family from food poisoning? First, food safety begins as early as shopping in the market and extends all the way to placing food on the plate. Therefore, the type of food we eat, how much nutrient we get from it, its appearance, its taste, and its money’s worth mainly depend on several factors. These include how well we select, prepare, store and cook food. Second, there must be good personal hygienic practices, good storage space, suitable container, and simple know-how on keeping foods cool and dry. * Shop for food on your way home. Do not leave perishable food in a car especially on a warm day. * Shop first for non-perishable food. Shop last for perishable food. * Pick up meat and refrigerated items last during your shopping trip. * Separate hot food from frozen and chilled products in your shopping cart and car. * Put raw meat in separate plastic bags before placing them into shopping cart/trolly to prevent meat juices from leaking into other products. * Wash hands with soap and water before handling food. Dirty hands carry microorganisms which can contaminate foods. * Wash your hands after handling raw meats, fish, and poultry. Do this also after using the bathroom, changing diapers, coughing or sneezing, blowing your nose, and handling pets. * Allow only persons free from infectious diseases to prepare foods. * Keep counters, cutting boards, utensils, and sinks clean. * Wash fruits and vegetables thoroughly with clean water especially those eaten with their skin. * Prolong the storage life of food by drying, freezing, canning and adding chemical substances like salt and sugar. * Use a spoon in tasting cooked foods. Wash spoon thoroughly before re-use. * Always keep yourself clean when preparing foods. * Avoid wearing jewelry like rings or bracelets while preparing food. These can collect dirt that may cause illness. * Wash dishes and other utensils thoroughly with soap and water. Wipe with clean cloth. Store these away from dust and household pests. * Before storing, fruits and vegetables should be properly sorted to avoid rotting of healthy fruits and vegetables: ripe from unripe, damaged from undamaged. Store only crops, that are of good quality, clean, mature, and free from disease and injury. * Always wrap or cover fresh leafy vegetables in moisture-proof bags or newspapers to retain product moisture and prevent wilting. * Refrigerate leftover foods as soon as possible after meals. * Consume leftover food within a day or two, or freeze them. Before freezing leftover, put the date on the container. * Transfer leftover canned foods to a clean and dry container and refrigerate. * Boil or thoroughly reheat leftover foods before serving. * If you have any doubt about leftover food, throw it away. * Heat fresh milk for 30 minutes at 62 o C using a double broiler to keep longer. * Don’t leave milk at room temperature. Always store milk in the refrigerator. Freezing of milk is not recommended. * Store eggs with the large end up, in a refrigerator. Never wash egg shell with water. Just wipe the shells with a clean, dry cloth. * In the absence of a refrigerator, eggs may be kept at room temperature for a period of one week. * Store canned foods in a clean, dry, and cool place. * Bulging of canned foods is a sign of spoilage. Do not eat food from a can that is bulging or has an off-odor. * Canned foods have a one-year expiration date from the date of manufacture. * Sun-dry beans and legumes for half day before storing or until crisp and hard. For ordinary storage which is about one month, place beans in plastic or katsa bag. Keep in a cool, and dry place where air circulates. * Place flour, rice and sugar in covered containers. Keep in clean, dry place. * Cooking not only improves the taste of food and softens fibers and connective tissues but also safeguards against disease – producing organisms. * Plan on the best ways of cooking and preserving foods to retain their nutritional value . One way is to cook with dry heat, e.g. baking, roasting, and broiling, cooking with fat/water.